Hope everybody had a great time in Charleston! 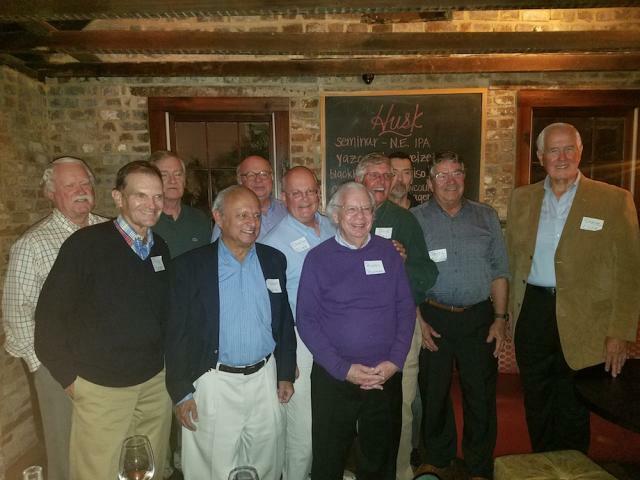 As with any reunions in later years, we probably all enjoyed seeing old friends but delighted in getting to know some classmates, plus spouses, a lot better than we ever knew them in the 60s. Despite having three AD brothers together at one time, there was no surcharge for physical damage to the building, and nobody got put on double-secret probation (that we know about). Our thanks to Steve and Judi Cline for structuring our agenda so thoughtfully. 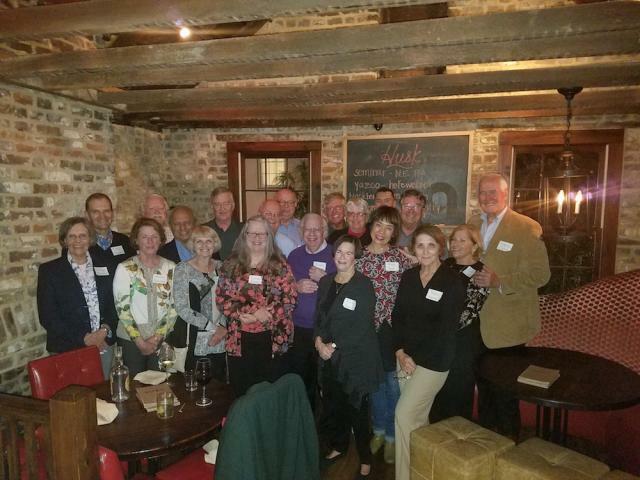 The initial gathering at the Husk carriage house was ideal for schmoozing with the drinks, yummy hors d'oeuvres, and all-you-can-eat southern cuisine. Gathering for breakfast at Millers was a brilliant stroke for regathering the next morning. Did anybody push away from the table still hungry? Not possible, and we didn't look all that bad in the daylight (did we?). Those who went on the walking tour with Mary Helen - the predicted bad weather holding off for our benefit - were treated to her very knowledgeable, very personable tour. And, boy, after two plus hours on foot, the gathering of most of us (10) at the sumptuous Magnolias was just right. I could get addicted to fried green tomatoes with a Bloody Mary. Did anyone walk away hungry? Looked like fat, happy, and running on low fumes for most. Bravo to those who pushed on to other activity, but it was clear that a regathering for dinner would be a forced march, so we went our separate and merry ways to enjoy Charleston on our own. All good, yeah? Let's hear your Wednesday PM stories! Jill and I headed right back to our hotel for power naps and then a light meal at the bar in Hotel Indigo with a chatty female bartender and fellow guests. How about you? So, we hold out hope that Bobby Pearlman and Lee Seabury will rejoin with us and about 300 other Classmates in Hanover in June. Maybe I will get some essays and photos out of the procrastinators for the 50th Reunion Book (time is about up for submissions), and we will all rest assured we are good fellows with amazing women, destined to live to 100 or die trying. Here's a great line (intentionally ironic or not, I can't say) I received from a classmate about his working or retirement status: "You couldn't pay me to go back to work." Hmm, sounds alarmingly like Reunion Book employment. Thanks for coming to Charleston or just being there and dropping in. Let Steve and Judi know your appreciation and thoughts on their fair city. Lee was visiting Emerson from MA and with Bobby Pearlman were Alpha Delta brothers. Robert and Charlie came from Atlanta while Gary Day came from Charlotte and Fred Becker from Southport, NC.